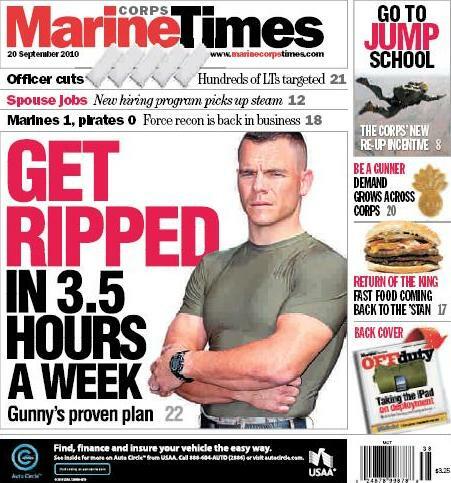 With that in mind, Marine Corps Times offers you up the story of Gunnery Sgt. Ken Young, who cut his body fat percentage from 19.5 percent to 6.8 percent, dropping 30 pounds in the process. And here’s the most impressive part: He did it in 12 weeks, working out 3.5 hours per week. When I graduated from boot camp, it was one of the proudest moments of my life. I loved that I would want into a story and people would ask if I was a Marine. But later, I started to worry when people asked if I was in the Marines or the Army. Finally, when somebody asked if I was in the Air Force, I realized I needed to do something. A wakeup call? Sounds like it. I am a veteran who is very interested in his program. I started the weight training this morning but have questions. One is, is this like circuit training where you don’t break between reps? 12, 10, 8, 6 then 12 one minute until the secondary, two to the next muscle group? Really hope to get an answer here, or maybe somewhere else? You take a 1 min break between each set except the 2nd set of 12 that is a superset then you take a 2 minute break between muscle groups. Hope that helps.